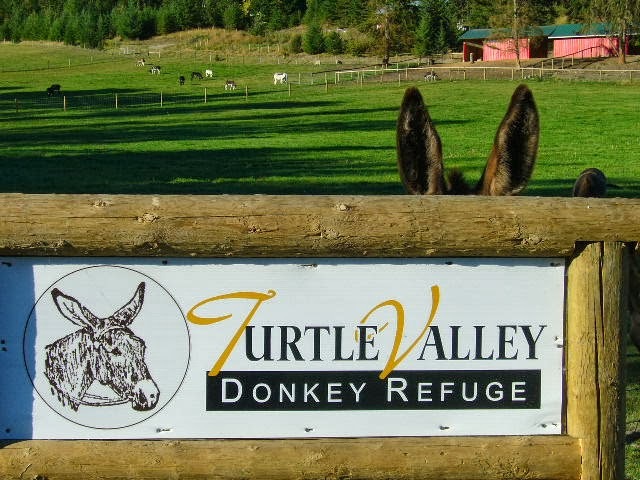 The Turtle Valley Donkey Refuge Society is a 50 acre facility located at 7877 Skimikin Road in the Turtle Valley near Chase, BC. We are dedicated to rehabilitating and caring for unwanted, surrendered, abused and neglected donkeys. When donkeys are abused they require years of special care, costly vet and farrier work and years of love and devotion to heal the scars made by man. We are blessed to be able to facilitate this healing with love and care. Donkeys are amazing creatures that have served mankind for centuries. Their tolerant, gentle nature makes them susceptible to unkind treatment. You need only to look deeply into a donkey's eyes to see how they have been treated. Each of their stories is unique but all have led them to this place of healing and rejuvenation. Your heart will be filled with compassion as you come to know their stories, or share a donkey hug, or even experience the joy of seeing your spouse, children, extended family and friends connect with one of these wonderful ambassadors for animal welfare, care and kindness. Help us make their world a better place. You will feel such joy!